Al Jennings, if we are to believe him, was for several years a close friend of O. Henry (William Sydney Porter), perhaps Americas favorite short-story writer. They met, Jennings claims, as outlaws on the run in Honduras, served time together in the Columbus, Ohio, Penitentiary at the turn of the century, and later met up in New York. Jennings, erstwhile lawyer, bank robber, and Hollywood consultant, was the subject of the 1951 movie ""Al Jennings of Oklahoma"", starring Dan Duryea. Although a suspect narrator at best, Jennings is a masterful storyteller in this 1921 classic. Jennings describes the horrors of prison life so compellingly that the book might have served as a call for prison reform. Yet he also tells how he, O. Henry, and their friends managed to cope. They secured jobs in the prison post office and pharmacy and managed to find a secret room near the kitchen where on Sunday evenings they retired for a fine meal - complete with wine secured from corrupt prison contractors - and good talk. As Jennings recaps their long, philosophical discussions, readers may wish to have joined them in the fancy New York restaurants they were later able to frequent. 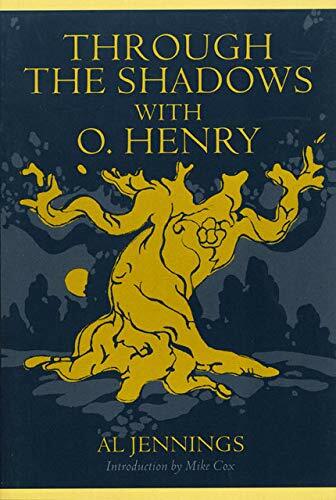 'Anyone reading ""Through the Shadows with O. Henry"" will agree that both of the author and his subject were characters worthy of any O. Henry tale' - Mike Cox.